The built environment of former socialist countries is often deemed uniform and drab, an apt reflection of a repressive regime. Building the State peeks behind the grey façade to reveal a colourful struggle over competing meanings of the nation, Europe, modernity and the past in a divided continent. Examining how social change is closely intertwined with transformations of the built environment, this volume focuses on the relationship between architecture and state politics in postwar Central Europe using examples from Hungary and Germany. Built around four case studies, the book traces how architecture was politically mobilized in the service of social change, first in socialist modernization programs and then in the postsocialist transition. 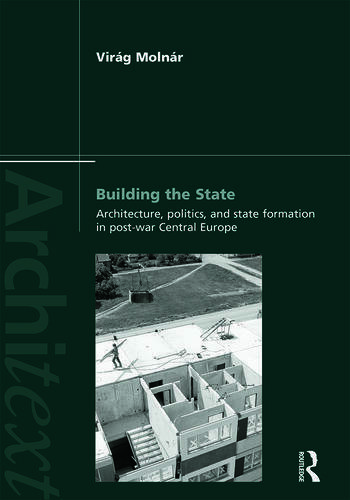 Building the State does not only offer a comprehensive survey of the diverse political uses of architecture in postwar Central Europe but is the first book to explore how transformations of the built environment can offer a lens into broader processes of state formation and social change. Virág Molnár is Assistant Professor of Sociology at the New School for Social Research in New York. She holds a Ph.D. in Sociology from Princeton University and her work focuses on the politics of the built environment and urban culture. "Building the State importantly demonstrates how architecture and urbanism construct political objectives by other means. In charting the changing roles and evolving self-identity of the architectural profession in two key parts of Central Europe between 1945 and 2000, Virág Molnár adroitly reveals the complex dialogue among modernism, socialism and nationalism." "This book offers a fresh perspective on the interaction between architecture and politics in East Germany and Hungary during state socialism and its aftermath. The author's approach, combining case studies and historical ethnography, is a delight for any reader, including architectural historians."